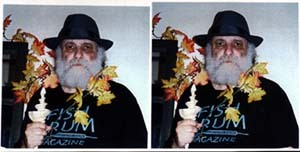 Greetings from Ira Cohen, wild man, friend, poet, et al., to all friends of Fish Drum. Medicine Show's 20th Annual Reading Series, Co-produced by Fish Drum Inc. THE PARIS JOURNALS reading with Michael Rothenberg and editrix Suzi Winson ANNE VALLEY-FOX'S CHAPBOOK OF POEMS. Editors from over 30 journals met to discuss their own magazines & the larger issues facing writing communities in general. Suzi Winson and Fish Drum was there in zebra stripes discussing literature. Did you miss us?